Here's one I'd never even heard of until I found it in the cheap-o bin. I love that this kind of thing still happens from time to time... and lucky for me, it was just in time for our Boo, Haunted Blog series! We open with Batman as he provides an introduction narrative for the story of a sixteen-year-old boy named Zack... a boy we will soon know much better as Scratch. He continues... explaining that when Zack turned fifteen one of his fingers grew deformed... and ultimately exploded. What remained was a gnarled claw... a shameful secret he kept, literally and figuratively tightly under wraps. Eventually, his entire right hand took the form of a clawed paw. One night... likely one with a full moon... Zack was beckoned into the woods by an internal urge. He feels sick... nauseous... suddenly, the transformation begins... his mouth juts out... his teeth grow pointy and large. Smells grow more vibrant... a deer is on the horizon... instinct kicks in... the poor deer never had a chance. In case I'm being a bit too obtuse, what I'm tryin' to say is the kid turned into a werewolf. He wakes up in his human state the following morning. He is laying next to the eviscerated deer, and tries to come to grips with his actions of the night before. He feels an itch in his malformed right "paw", and wanders further into the woods. What he wasn't prepared for was how tired his body would be from last night's activity... and so he slumps over... passing out in sight of a tiny cabin. A woman and two children discover Zack's body, and after noticing his deformity, decide to take him in. This is an interesting scene, as we don't get all that good a look at the boy's saviors. We mostly see them from behind... and while we do kinda get to see the woman's face, it is mostly covered by her hair. Zack wakes up and he and we get an eyeful of his rescue party. It's a pretty staggering sight... they are all physically deformed. Zack feels comfortable... and hopeful, for the first time in a long while. Morning comes, well two-days later... and with it, a whole bunch of backwoods yokels. The creepy sheriff and a bunch of hillbillies are outside of the cabin, accusing the woman (Miss Sage) of abducting a young girl who had recently gone missing. Sage is steadfast in her innocence, and we learn that at one point in the past, she herself had lost a daughter. This ain't good enough for the yokels, as one of them chucks a rock at her big-headed "son's" big-head. The sheriff is done negotiating and prepares to storm the cabin in search of the missing girl. By this point, Zack is up and stirring again... and he's not too keen on the small-towners invading his newly-found safe place. He puffs out his (bare) chest and tells them to beat it. They notice his hand-paw, and decide that discretion is the better part of valor. As they depart, the sheriff posts a notice for the missing girl to a nearby tree. We now shift to a brief cameo of a hulking monster with a bunch of eyes. It carries a sack... presumably one that contains a living human... perhaps even the missing girl. It walks past a tree with the missing girl poster, and tears it down. The poster, that is... the tree is fine. With all the excitement having died down, we get a quiet moment between Zack and Miss Sage. She reveals that she came to town as a physical therapist... sent by the government as a public relations ploy... because this area had suffered a Chernobyl-style radiation bath, which led to a bunch of deformities and what-not. When the funding dried up, she stayed out of moral obligation. She shares that her deformity was with her since birth, and not a result of radiation. Outside, the children see the eyeball monster chowing down on some livestock. Zack "Scratches" up and lunges into action. He yells at the beast to let the girl in the bag out... to which, the voice from the bag agrees... but, not with much of a sense of urgency. She also calls the grotesque critter "Gloop-Gloop"... so, we will too. So... Gloop-Gloop, he ain't all that impressed with our teenage werewolf... He grabs him by his teeth, and slams him into the ground... at which point, he returns to his boyish figure. Ya know, when I chose this book to review I would'a bet money that I was going to hate it. I'm not sure what I thought we'd be getting here... but I was sure I wouldn't like it. After actually reading it, however, I thought it was pretty good. 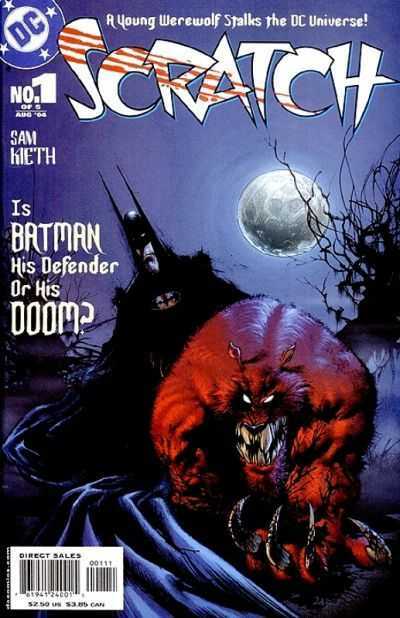 Not much for werewolf stories myself, but in the context of the greater DC Universe, this could be quite fun. I did have some reservations in regard to the art. Sam Kieth is pretty hot and cold with me. I really enjoy his humanoid monster type of work, but found his "straight" humans as almost nightmarish. Not that they are scary, or ugly... they just don't feel "real". They feel "off" in a way that makes me feel a bit uncomfortable. Can't really explain it. With all that said, his style fits this story to perfection... and I don't think it would have been nearly as effective with anyone else on art chores. Overall... a good first issue, and introduction to this Scratch fella. I'm glad Batman didn't loom quite as large as I feared he might... and I'm quite interested in seeing how this all turns out. This isn't a series that I see too often in the wild... in fact, when I grabbed this one... it was the first time I'd ever heard of it... so, it may be a bit of a challenge tracking down the remaining chapters. Sam Kieth is one of my favorite all time artists. Thanks for sharing. I've got issue #2 of this reviewed and ready to post on Tuesday...Today is all about Marvel, but I'm making A Marvel-DC-Marvel Werewolf/Classic Monster Oreo this week. I think I find Sam Keith more favorably than you do and agree that in this series he really, REALLY shines. He even manages to convey an innocent purity that is still loving out of the Sage character in a way that almost makes her attractive BECAUSE of her physical differences. I was won over by the art. The story is pretty slow and decompressed.